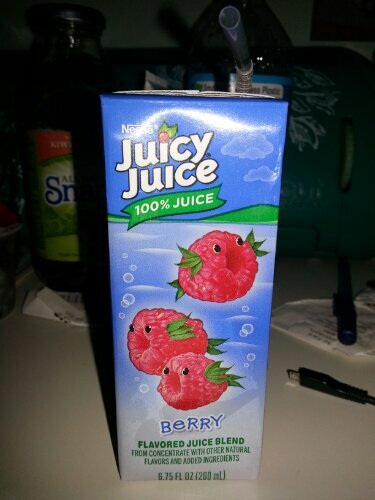 I found larger juice boxes! The ones I had before were about half this size and just weren’t big enough. Plus, these new ones have facts about pufferfish. Juice and a little education. Perfection. Time for a little pre-bedtime snack. I promise the goldfish bag appears larger in this picture than it is in real life. It’s just a snack, not a meal. That would be an insane amount of goldfish. Oh and because it wouldn’t be fair to show a photo of Snapple without sharing the real fact inside, did you know a hippopotamus can stay underwater for five minutes? Strawberry Shortcakes are my weakness. They’re amazing! And I know it’s unlikely that they have actual strawberry in them, but I still love them. Little pre-bedtime snack. Low fat strawberry Pop-tarts. Some things you just never grow out of. I had my first Snack Pack pudding in forever tonight. Amazing! Now it’s made with nonfat milk, but it’s still good. Ron brought home Chinese for dinner tonight. I actually ate a decent amount but that was a few hours ago and I’m hungry again. So I made myself some frozen Tyson mini chicken sandwiches. They remind me of chicken littles, which used to be the best thing on the KFC menu until they discontinued them, brought them back out and discontinued them. They should really rethink that. This stuff is amazing. Annie’s Organic Pizza Snack Mix. It has little butter and cheddar bunny crackers and pretzels in it. And it’s certified organic. Amazing. You can also get a Cheddar version and a chocolate one. Perfect for watching The Lincoln Lawyer, which is also amazing. Ron and I saw it in the theater and then rented it from redbox tonight. Definitely worth watching. So good, yet so bad. I admit, often I go to the theater just for the popcorn. And, no matter how nice a theater is or if its the only one showing a particular movie, I won’t go there if the popcorn is bad. It’s a deal breaker.